Stay on top of the latest kitchenware trends | Atelier du Chef - Looking for the highest quality knife? Looking for the highest quality knife? Search no more! The most demanding chefs and home cooks love Global products. Over a 1000 years ago, the Japanese developed the art of making exceptionally solid and sharp blades for the Samurai. Global is proud to continue this tradition. The complete range of knives is manufactured by Yoshikin in Japan. Each knife is meticulously weighed to ensure a perfect grip, just like Samurai swords. Each blade is crafted from the highest quality CROMOVA 18 carbon stainless steel, ice-tempered, and hardened. Blades remain sharp much longer than with other types of stainless steel. They are remarkably stain, corrosion, and rust-resistant. Their single piece construction eliminates food contamination risks. Global knives were created 1985 by the visionary designer Komin Yamada. At the time, he was mandated with the creation of a revolutionary line of kitchen knives. He used the best materials and latest manufacturing technologies. His mission: to please renowned as well as amateur chefs! Global knives are appreciated around the word for their exceptional quality. Mission accomplished! 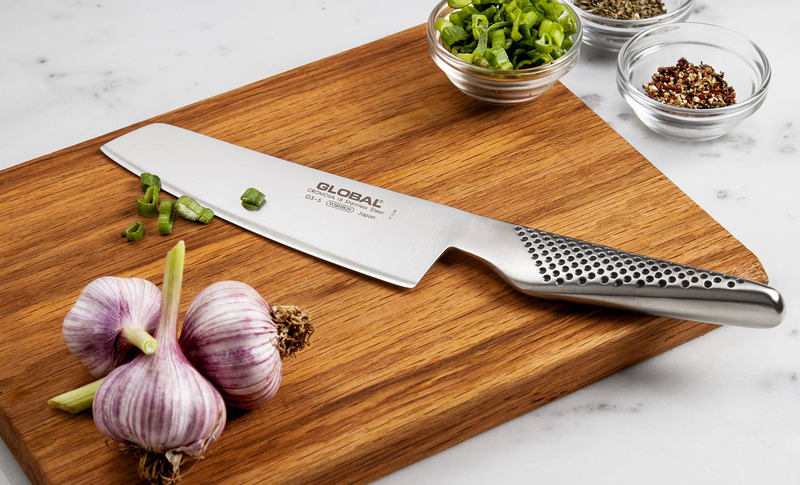 Global uses exclusively manufactured stainless steel for the manufacturing of their knives. Their specially crafted steel is so strong it stays sharp while being easy to sharpen. High chromium content in the steel make these knives stain resistant as well. The most important part of a knife is its edge, which has become Global’s trademark. Most knives are double-edged, but Global’s sharply angled edges make these knives sharper, longer. Global’s unique combination of quality stainless steel and blade design make these knives the sharpest on the market! We proudly offer Global products because we know our customers enjoy the highest quality tools. We offer a variety of Global knives that will suit every one of your needs! G Series knives offer classic shapes with longer blades and an ergonomic hollow handle that will please the most demanding chefs! Come see and discuss the advantages of Global’s complete line of specialty knives with us. Their finesse, durability, and quality manufacturing are sure to impress you! Visit our store for a list of available products!